Sharpie: If you love the classic “Jack-o-lantern” look without the bother of the carving process, simply draw in the eyes, nose and teeth in your favorite scary expression. The pumpkin will last all season. Plus, you’ve created your roadmap should you wish to carve it out for Halloween. Paint: A bit of craft paint and some imagination will transform any size pumpkin into a work of art. Because the pumpkin shape is as iconic as its color, there are no worries about obscuring the theme by painting it in any style you wish. Stripes, colorful zigzags like a Missoni pattern, and blue and white porcelain patterns are a few great ideas seen online. How about painting a pumpkin in metallics for a rich look, or chalk paint for homespun appeal. Create silly faces, chic polka-dots, or ants and spiders crawling all over -- a real attention-grabber! Flowers: Decorate a party table with flower covered pumpkins rather than a standard centerpiece. Simply hot glue chrysanthemum flower heads all over the pumpkin. If you prefer, you can use a long pin to secure the posies to the pumpkin. Yarn: All knitting fans end up with leftover odds and ends of yarn in their collections. Try wrapping pumpkins in colorful yarn in a mixture of designs. Paint the pumpkin surface with clear dry craft glue and lay the yarn in desired patterns. Gauze: Pumpkin Mummies? Of course! 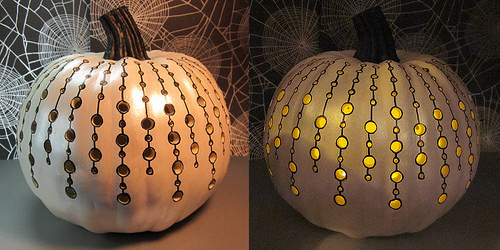 Simply coat thin gauze strips in craft glue and wrap your pumpkin in otherworldly style. Paint or draw in some eyes peaking out from under the bandages. Decoupage: Mod Podge and magazines: a great way to decorate your favorite pumpkin in any theme. Create a “stained glass” look by applying colorful papers randomly around the entire surface of the pumpkin and filling in the spaces with black or metallic paint. Excellent, fashionable examples of decoupaged pumpkins can be found on Hometalk.com, where blogger Between Naps on the Porch posted super pics of her high fashion pumpkins. Ribbon: Glue or pin decorative ribbon in different colors and patterns to the “spines” of the pumpkin from the cap to the bottom. Ribbon comes in so many colors, patterns and sizes that it will be easy to find the combination that works with your decor or party theme. Nailhead trim: Metal upholstery nailhead comes in a variety of finishes, patterns and sizes. Create a one-of-a-kind pumpkins for your interior or exterior with nails and a hammer (use your own or borrowed from your favorite local carpenter). Adding a monogram or house number would be a creative way to greet guests or as a personalized hostess gift. Solid Gold Vinyl House Numbers? Yes, It is Real.